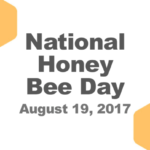 Did you know the third Saturday in August is National Honey Bee Day?! The holiday was created to remind everyone how important our little pollinators are for many of the foods we eat. So, in honor of all the hard work our girls have been doing, Butter Bakery Café (3700 Nicollet Ave S) will have specially made treats using our very own Kingfield Honey! Stop by on Saturday, August 19th and try a piece of a honey pecan carrot cake or perhaps a chocolate honey scone. Not only will your taste buds thank you, but you will be helping support our urban bee hives. Educate yourself on the dangers and risks with homeowner pesticides and chemicals. Whenever possible, choose non-damaging and non-chemical treatments in and around the home. Nicollet Ace Hardware (3805 Nicollet Ave S) carries a wide variety of products that don’t hurt our bees. Plant a bee friendly garden with native and nectar producing flowers. Use plants that can grow without extra water and chemicals. Native plants are the best to grow in any region. Backyard gardens benefit from the neighborhood beehive. Our bees might even come to visit! Understand that backyard plants such as dandelions and clover are pollen and nectar sources for a wide variety of beneficial insects, including the honey bee. Some gardeners see dandelions and clover as an unwarranted nuisance, but really, a perfect lawn is not worth poisoning the earth. Thanks to Suzie Lillyblad and Dan Swenson-Klatt at Butter for finding such a yummy way to help us all celebrate our Kingfield Bee Hives!